The world leading motherboard and mini PC manufacturer - ASRock, announces DeskMini 310 supports Intel the latest 9th Generation Core series 65-watt LGA1151 processors. ASRock DeskMini 310 adopts with Intel H310 chipset, supports up to 32GB DDR4-2666MHz memory, dual 2.5-inch hard drive and one M.2 2280 PCIe Gen3 x4 NVMe SSD. ASRock provides various optional accessories of DeskMini 310, includes USB 2.0 cable, VESA mount kit, and Wi-Fi ac kit. 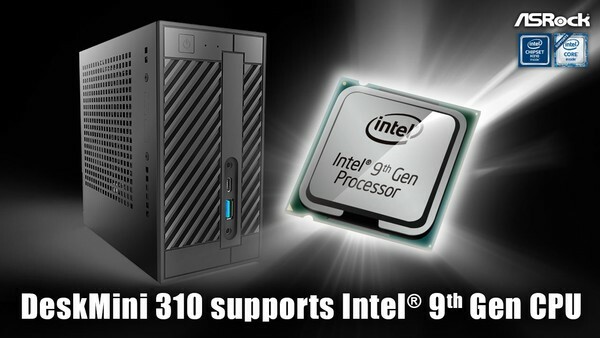 With comprehensive accessories, DeskMini 310 can satisfy diverse demands from all users.